Competitive gaming can easily make for the most entertaining subject for a documentary, especially when a world record is involved. This said, it is important that such a documentary is able to overcome an existing stigma against video games in order to appeal to the widest audience possible. Whether or not “The King of Kong” succeeds in that regard really depends on who you ask. For the film’s intended audience, the surprisingly dramatic story of a man who dared challenge the Donkey Kong high score of world record holder and hot sauce tycoon Billy Mitchell is definitely one that hits hard. For anyone else however, it’s a little bit more up in the air. The story here isn’t at all complicated. Billy Mitchell is the best Donkey Kong player in the world- and perhaps nobody knows this as much as he does. 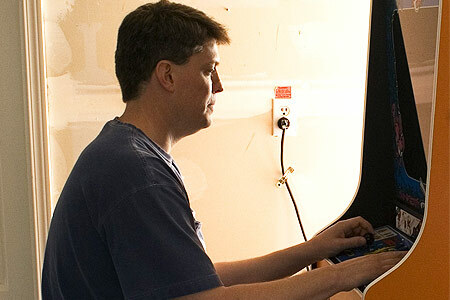 Steven Wiebe on the other hand is a middle school science teacher with a Donkey Kong machine in his garage. The contrast between “rockstar” and “everyman” is certainly present with these two individuals despite never being overtly stated. While Wiebe desperately yearns to challenge and defeat Billy Mitchell at his turf, the narrative and structure of this film brings far more emotion to the surface. This emotion is simply that of a man who has been down on his luck for the vast majority of his adult life. The innocuous Steven Wiebe is still determined to prove his worth by training in his garage to work his way up to the top, despite the many hoops he has to jump through along the way due to his lowly “everyman” status. Billy Mitchell on the other hand is portrayed hilariously as the unsubtle villain of the film. Stoic and cavalier as ever, Mitchell is a man who refuses to lose and thinks little of any Steven Wiebe sob story thrown his way. Perhaps this film’s most amusing success is the simple fact that it is impossible to tell whether or not Billy Mitchell is playing a character of any discernible irony. And all of these positives reign very true for a member of this film’s target audience: people who occasionally play games but have little interest of knowledge of competitive gaming. For those however who subscribe to the belief that video games are entirely a waste of time, “The King of Kong” in all its underdog sentiment will likely not change any minds. Similar can be said of viewers who are more actively involved in modern competitive gaming- although this audience will likely instead find the arcade culture and number-score competition somewhat antiquated for its far more modern tastes. If “The King of Kong” had a slightly better idea of how to overcome existing stigmas regarding video games, it would have a very easy time resonating with any viewer. This said, the film succeeds overwhelmingly in its attempt to bring to the surface incredibly relatable sentiments of inadequacy and determination against all odds. This entry was posted in Articles, REVIEWS and tagged a fistfull of quarters, billy mitchell, comedy, documentary, donkey kong, steven wiebe, the king of kong. Bookmark the permalink.